Does his eye look weird? 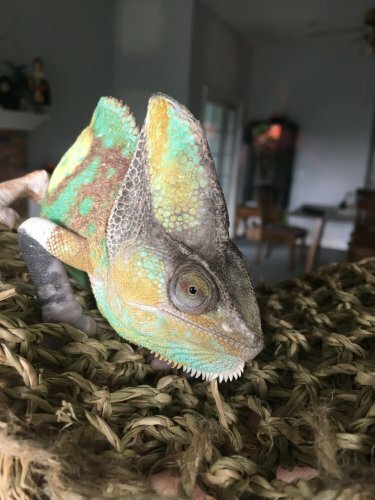 As a new cham owner I am trying to get used to how he is! 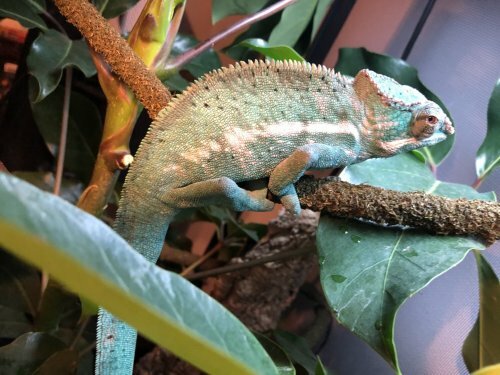 He seems to finally be settling in but his eyes seem to be maybe puffy? Or it's normal! 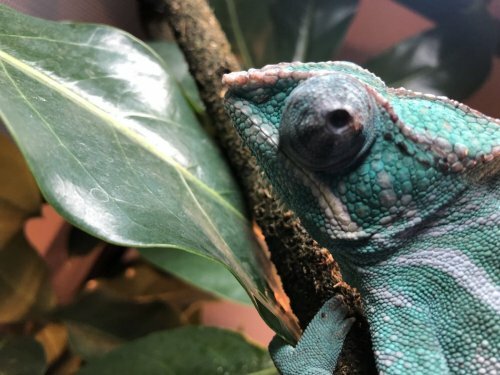 I tried looking at other Chams but their eyes don't look like his! Not puffy, just the opposite, he looks dehydrated. How often do you mist and for how long? Do you have a mechanical mister, or do you mist by hand? Like I said, he looks dehydrated. Have you seen his urates lately? 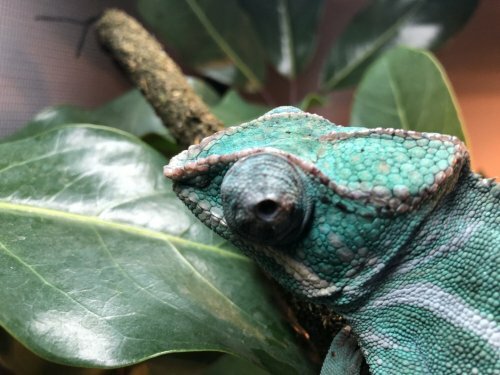 I just cleaned his cage yesterday and there were a few spots he had urinated in. As for today no! They need at least 2 minutes of misting to stimulate the urge to drink. Do yourself a favor and buy a Mistking, it really is worth it. Once you have the timer set, it's all automatic. All you have to do is fill his reservoir about once a week (5 gal bucket). Once it's set up you don't have to worry about making time to mist. for now, give him extra misting's to re-hydrate, and consider putting him in the shower. If you don't know how to do that, use the search function, it is thoroughly discussed in numerous threads. Thank you! Now I do have an automatic mister but one thing led to another and I set up my reptirain wrong. So when it mists the cage it's at a spot he usually isn't in! My plan was to just get the nozzles from the mistking and see if I can change that out so I don't have to pay the full prise for the while misting machine. My mister works it's not I fucked up and I had it going on but obviously it wasn't working out very well. Every three hours for 45 seconds is what I had. Do you think if I kept my mister and got the nozzles from the other mister that it would fix and I could use that? 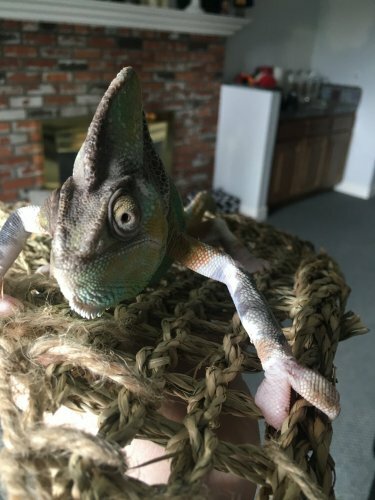 I don't have knowledge about the Reptirain, but I know Mistking it top quality that will last many, many years. Misting for 45 seconds is not enough. My mistking goes off just after lights on in the am, and mists for 2 1/2 minutes every 3 hours till lights out. Lights are 12 on, 12 off. Until you’re able to get the mister sorted out you could set up a dripper. It can be as simple as a bottle with a small hole in it. Also, are your feeders hydrated? That can help. For my roaches, and crickets when I have them, I use a bottle cap with some cotton in it soaked with water. I’ve actually watched the roaches all huddle around to drink after shopping, kinda cute! You could give him a couple horn worms to get some more moisture into him as well. Not a staple to be fed every day, but they are full of water. Given that you said his urates are white, though, it may be wise to review your lighting and supplementation. 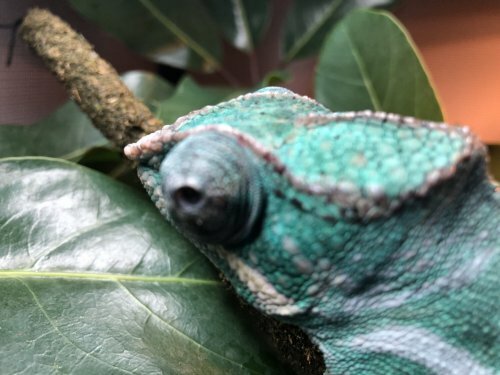 White is an indication of good hydration, and eye issues can often be indicative of a vitamin issue, especially vitamin A.
I just got a new chameleon ... he has this same issue and I will be taking him to vet Monday. 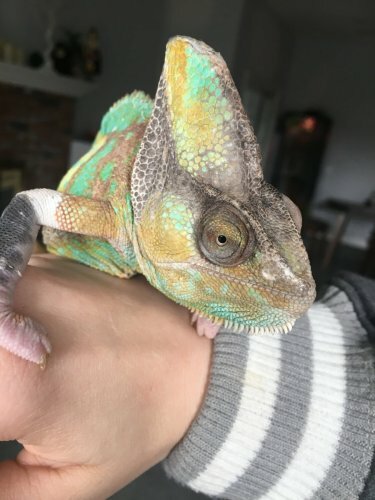 I’ll let you know what was determined... here’s a pic of my little dude... as you can see he has the same “puffiness” it’s almost cloudy and he looks blind. 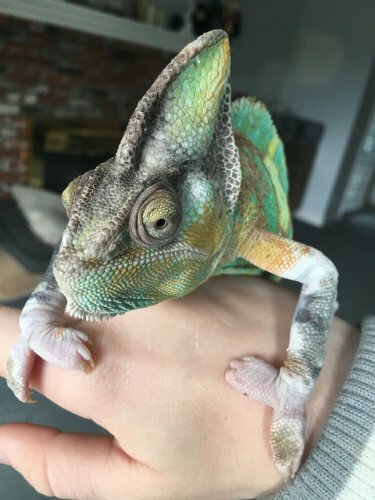 I JUST got this dude and noticed these issues when I picked him up... but like I said I go to exotic vet specialist on Monday morning . My guess is vitamin A deficiency.. maybe issues with the lighting in his previous cage ... we will see! 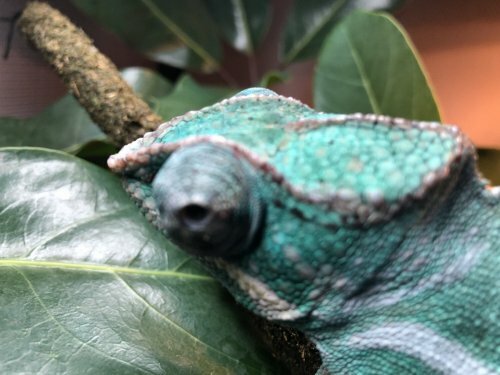 Your chams eyes does no look like Nat's chams eyes.